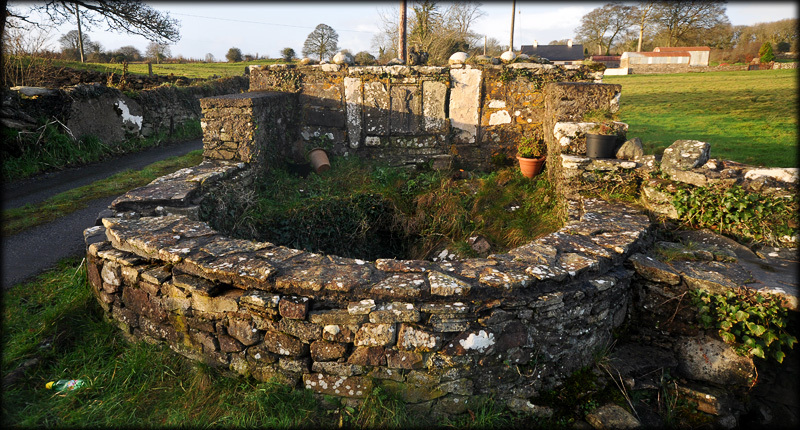 The well here in Clogher is named after St Attracta. In local foklore she is believed to have slain a serpent at the site of the well. A serpent is usually a fertility symbol and along the top of the wall are several cursing or cure stones known locally as the 'serpents eggs'. Traditionally, a woman wishing to have children would bring a stone home with her and return it later after giving birth. These cure stones are now cemented into the top of the wall. Sadly on our visit the well seemed neglected and badly needed some care and attention. It is such a pity as the well has some very interesting features besides the cure stones. 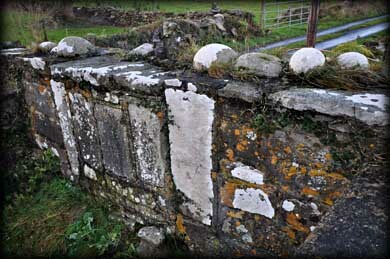 Built into the face of the well house are five very worn cross slabs, the best of these bears a crucifixion scene, see above. Inside the well house sits a huge boulder with a large bullaun that is about 0.3 metres deep and approximately a quarter of a metre in diameter. 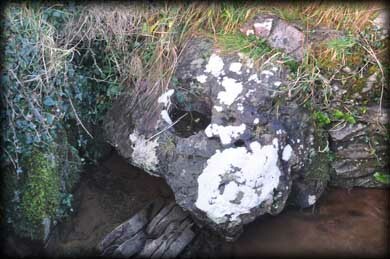 The well is one of a number of interesting sites in the Clogher area, another being the nearby Clogher Stone Fort. We tried to visit there also but due to very wet ground the site was inaccessible. Hopefully we will be able to call back to Clogher in the summer months, when the holy well might also be in better condition. Situated: From Ballaghderren on the N5 head towards Monasteraden the well is situated about a kilometre before Monasteraden, on your left.